Enchanted Forest Sanctuary | Florida Hikes! It’s not rocket science: the first and finest of the Brevard County EEL (Environmental Endangered Lands), Enchanted Forest Sanctuary in Titusville is a fabulous destination for family hiking. From the moment you step out of your car at the trailhead, you realize this is a magical place. It has a little bit of everything, including historic sites, geological oddities, massive trees, gardens, and a diverse amount of habitats along its trail system, with the spine of the Atlantic Coastal Ridge a prominent landform down the middle. There’s even a nature center filled with information and interactive exhibits about the habitats and history of this corner of Titusville. Located right outside of Kennedy Space Center off US 1, this preserve has blossomed over the past decade into a true treasure, a must-stop for any families who love the outdoors and are visiting the Space Coast. Enchanted Forest Sanctuary is open Tue-Sun 9 AM to 5 PM. The gates lock automatically, so be sure you leave in time! The nature center has a nice gift shop inside as well as restrooms and a water fountain. Guided tours are available for persons of limited mobility. No bicycles are permitted on these trails. From I-95 exit 215, Titusville, drive east on SR 50 to the first traffic light. Turn right onto SR 405. Follow it for 4.4 miles to the park entrance on the left. If you reach the US 1 overpass, you’ve gone too far. Sign in at the “Hike Desk” prominently displayed outside the nature center before you head out on the trail system, and grab a trail map here. If you’re not in a rush to beat the heat, check out the displays in the nature center first to help with your understanding of the historic sites amd habitats along the trails. The new trailhead for the trail system is around the back side of the building. Follow the sidewalk from the hike desk past the nature center entrance and turn right, following the edge of the building past a native plant garden. 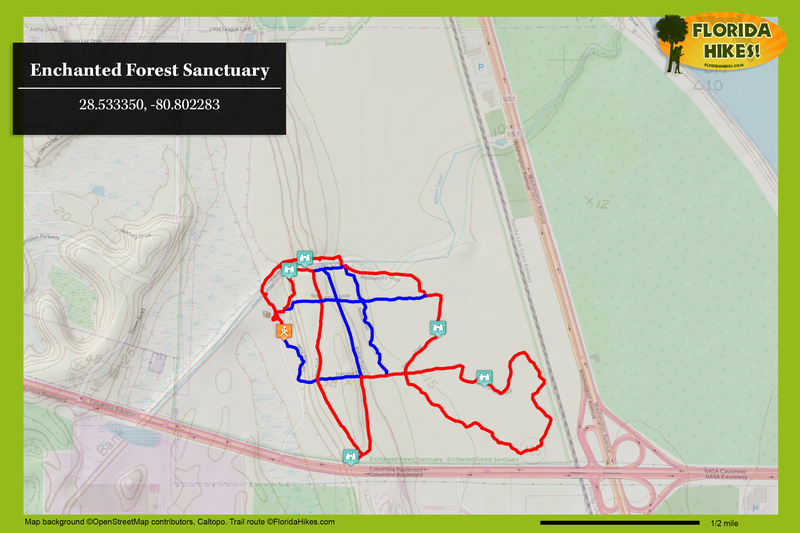 Follow the trail into an oak hammock along the Biodiversity Loop, which is the first of several trails you’ll be stitching together to keep to the perimeter of the trail system. 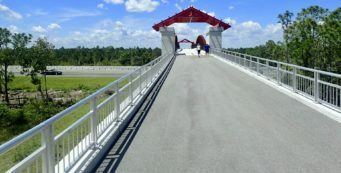 At the junction with Enchanted Crossing, continue straight ahead along the Biodiversity Loop. The trail immediately reaches a T intersection. To the right is a gate leading out to the parking lot. Turn left. You’re walking along the edge of a scrub forest on a well-groomed footpath, with aromatic silk bay providing some shade. The oak canopy is much thinner than it was before the hurricanes of 2004-2005, but it’s still a good representative upland forest with a lot of young shrubs in the understory. 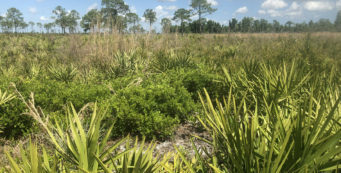 Pass Marker 20 – pointing out Florida’s scrub aromatherapy, the silk bay – and you may see some plants flagged with flagging tape for closer study. As the trail continues up a gentle slope, you come to a junction with a bench atop the Atlantic Coast Ridge. This ridge outcrops in many places along Florida’s Atlantic coast, most notably in places like the Coquina Beach at Washington Oaks State Park, Blowing Rocks in Jupiter, and in downtown Coconut Grove. It’s a long spine of coquina shells compressed over the ages into a ribbon of eroding limestone, and comprises some of the highest points along Florida’s Atlantic Coast. Here, it signals a segue in habitat to young scrub on white sand with little to no shade overhead. The junction is with the Ridge Trail. Turn right. The Ridge Trail works its way along the econtone between the high open ridge and the upland forest. You pass a bench, and there’s a tall magnolia tree up ahead. Dropping downhill, you come to the Tortoise Trail at 0.3 miles. It crosses over the Ridge Trail, leading downhill to the parking area, and was the original access trail when the preserve opened a decade ago (then called the Lime Trail). Cross it and keep to the Ridge Trail. As you’re nearing the south end of the preserve, you can see lines strung up to call attention to powerlines for low-flying airplanes, since there is an airport across the street (which makes for a hum overhead on the weekends). When you reach the Coquina Quarry side trail at 0.5 mile, turn right and head down the narrow path to see the historic quarry. The sand turns orange beneath your feet as you drop down into the quarry itself, a pit in the Atlantic Coastal Ridge from which coquina was dug for building materials. The quarry provides a window into the geology of the ridge, including its solution holes. Returning up the path you entered on, turn right when you reach the Ridge Trail. It starts to loop around the ridge and head south, with stands of cabbage palms in the distance and older forest downslope to the east. At the next junction with the Tortoise Trail, there are a couple of benches. Turn right to head downhill into the shade. The Tortoise Trail makes a quick decent from the scrub into a forest dense with magnolias, oaks, cabbage palms, and saw palmetto. Cabbage palms tower overhead as you reach the junction with the Mesic Trail. Continue straight. The trail ascends up a slight rise and a reaches a multi-trail junction with a kiosk and a gathering of benches. You’ve walked 0.8 mile. Start the Magnolia Loop by turning right. This is one of the highlights of the preserve, so don’t skip it! Lushly canopied, it starts off by passing a large live oak with an unusual curl to its trunk. Wild coffee fills the understory, and cabbage palms rise high overhead. Hurricane victims – pieces of old oak trees – bring new life to the forest floor. Spagnum moss carpets fallen logs. One log hosts a variety of fungi; the next, a natural fernery for sword ferns. The trail continues to descend, and you walk under the large limbs of an ancient live oak. Curving left, it ascends slowly and makes a banked curve to the right and downhill. You see more tall cabbage palms rising ahead. It is cool and dark under the canopy, with pools of sunlight on the forest floor. As the trail continues to descend, there is a floodplain forest off to the right behind a screen of trees; in winter, the red seed pods of red maple belie its presence. The trail comes up to a magnificent oak, an oak that would take quite a few people holding hands to encircle it, with a cabbage palm growing straight up the middle. The sharp smell of fungi is in the air as you walk past many fallen logs. Towering southern magnolias – some with branches sprouting out of large branches, they’re so tall – are next along their namesake trail. Turning a corner, massive oaks compete for the “king of the forest” crown, a sight to behold. Around each corner, there are more massive oaks and magnolias, a sight to behold. Wild citrus, including oranges and grapefruit, grow in this part of the forest. 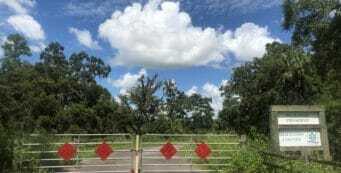 Many settlers passed through here on the Hernandez-Capron Trail, an old military trail laid out by General Joseph Hernandez and built by his men in 1837, during the Second Seminole War, to link the fortresses at St. Augustine and Fort Pierce. The trail enters an unusual little forest, a “forest within a forest” at 1.1 miles, a dense stand of yaupon holly. This holly is notable for its tiny leaves and for the use of its berries to create cassina, the highly-caffeinated “black drink” of the Seminoles and other more ancient Floridians. Keep to the right at the fork in the trail. Emerging into a paradise of palms, oaks, and ferns, the trail leads you down a corridor of tall cabbage palms. There’s dark earth underfoot, an area that may get damp after heavy rains, with more massive oaks spreading their thickly knotted root systems across the trail. The buzz of traffic is off in the distance along US 1. Passing through a stand of marlberry and wild coffee, the trail begins a slightly incline upwards, and there are now tall slash pines making up the canopy. Dropping down, the trail skirts the floodplain forest, which is exuding an earthy aroma, and heads into another palm hammock. The swamp in the forest, downhill and to the right, becomes more obvious around 1.4 miles, with bubbles rising to its surface from gasses emitted by rotting leaves beneath the water. The trail continues to rise away from it. 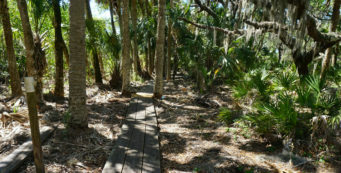 Climbing through a rotted log, the trail keeps up a mild uphill beneath the palms, and the footpath broadens and becomes easy to walk once again– no more gatorbacks to trip over. After you pass a bench, you’re back at the clearing where the Magnolia Loop began, after 1.7 miles. Turn right to follow the Tomoka Trail to stay on the outer loop of the trail system. The high canopy isn’t what it once was, but the trail immediately drops down through a tunnel of vines, with cabbage palms providing the canopy. There is a bench at the beginning of a zig-zagging boardwalk that works its way through the floodplain forest. Strap ferns sprout from fallen logs like bright green feathers. Open pools of clear tannic water are edged by ferns. Reaching the Biodiversity Loop junction, turn right to stay on the outer loop. It immediately becomes a boardwalk through more floodplain forest. An interpretive sign provides information about the Addison Canal, which affects the hydrology of this landscape. The trail narrows down and becomes a bit bumpy as it parallels the canal. There are saw palmettos here with a tint of silver to them. The trail narrows into a long corridor, with the Addison Canal hidden off to your right behind a tall levee topped with dense forest. Bromeliads of pineapple size drape from tree limbs. Just beyond the junction with the Mesic Trail, the Coquina Trail veers off to the right. Turn and follow it downhill. It has a nice narrow descent and a wooden bridge over the canal. The water is tannic but clear, with oranges floating in the mild flow. Benches on the far side of the canal provide a scenic view. As the trail turns left, it parallels the canal, and it’s a very steep drop – an actual cliff – down to the bottom of the canal. Several cleared spots in the cabbage palms provide an excellent view of the canal. Started in 1912, the Addison Canal was probably meant to drain the extensive wetlands between the St. Johns River and the Indian River Lagoon for development. Remains of the canal stretch from the Canaveral Marshes along SR 50 under I-95 to the Enchanted Forest, where construction abruptly ended when the diggers hit the impenetrable Atlantic Coastal Ridge, ruined their equipment, and went bankrupt. Here’s where you need to keep an eye on the kids. Steep cliffs and poison ivy provide hazards off to your left. After 2.1 miles, the landscape opens up in front of you– you’re back on the top of the Atlantic Coastal Ridge, with scrub a sharp contrast to the leafy glade of cabbage palms along the canal. A bench sits off to the right and unmarked trails vanish into the distance. Ignore them and continue paralleling the canal, and you’ll be rewarded with some excellent views of the geologic formations where the ridge was cut deeply into. Strap fern clings to boulders on the far rock face. The terrain here is undulating. Perhaps the dune lines of an ancient shore? As the trail drops down off the ridge, it is soft sand underfoot, much like climbing down through dunes. A large gopher tortoise burrow is off to the right. The trail is broad, open and sunny here. 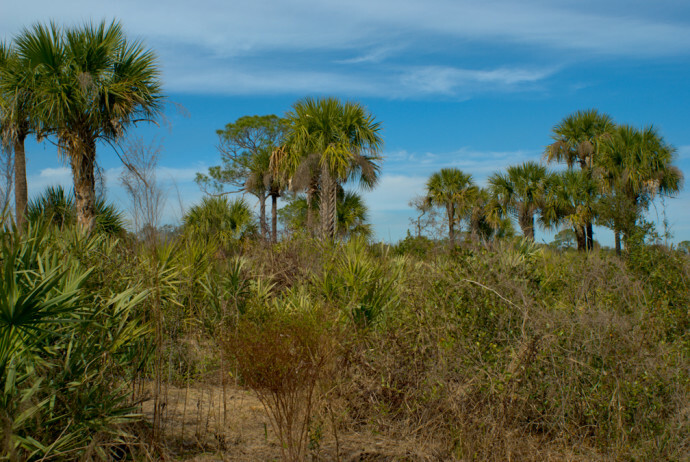 As the trail narrows, curves, and drops down lower, it is lined with young cabbage palms. You emerge within sight of the nature center and a historic marker for the canal. Slices of coquina, shot through with solution holes, are centerpieces in a garden of native plants. The odd look of these rocks evokes moonscapes, appropriate given you’re just a mile or two from Kennedy Space Center. Work your way through the garden and back past the nature center. Be sure to sign out at the Hike Desk on your way out! are dogs on a leash aloud? Dogs are not permitted in any of the Brevard County natural lands, including Enchanted Forest.